Emerald and gold jewels like the present piece are typical in both style and composition of Spanish jewellery of the seventeenth and eighteenth centuries, largely due to the country's longstanding history with the two precious materials. The Spanish conquistadores are famous for their quest for gold in the New World, which commenced with the explorations of Christopher Columbus in 1492. Not only did they find gold, but also emeralds, and of a quality unseen in Europe until this time. The Spanish crown quickly made it a priority to discover the source of the stones, and in 1538 Don Gonzalo Jiménez de Quesada, founder of Bogotá, discovered mines in central Colombia. Examples of gold and emerald jewellery made in the Americas have been preserved due to a number of shipwrecks of Spanish galleons, most famously that of the Nuestra Señora de Atcoha, which sunk off the coast of Florida in 1622 and was rediscovered in 1985. The hoard included one hundred and twenty five gold bars, as well as contraband jewellery and emeralds, including a seven pound gold chain and a 77.76 carat emerald. 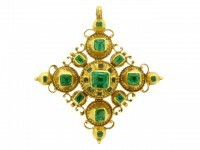 From this time until the independence of Colombia in 1819, gold and emeralds featured heavily in Spanish jewellery. Crosses were perhaps the most common jewellery forms, in part due Spain's uninterrupted standing as strongly Catholic country. That said, crosses of this type were en vogue throughout Europe in the seventeenth and eighteenth centuries. In 1752 the fashionable Lady Jane Coke was quoted as saying, 'You can't make a mistake as to the length of your cross. You may either wear it high upon your neck or let the bottom of it touch the top of your stays.' Of various designs, most popular were the Latin and the Greek form crosses, of which the present piece is an example of the latter. Typically crosses such as these were suspended from a bow, called 'lazo' in Spanish, which could be attached to a ribbon to be worn as a choker or converted to a brooch to be pinned directly to the bodice. Both the construction and style are particularly Spanish, with table cut emeralds set into circular bosses decorated with graining and applied scrolled ornament. Pieces such as this appear in portraits of the Spanish court from the seventeenth through the late eighteenth centuries. It was likely made in Córdoba, Spain, which was renowned for its jewellery industry during this period. Similar examples can be found in both the Victoria and Albert Museum (M238-1864 http://collections.vam.ac.uk/item/O116858/pendant/ , M.83-1913 http://collections.vam.ac.uk/item/O116845/pendant/) and the British Museum (1951,1009.1). Ginny Redington Dawes and Olivia Collings, Georgian Jewellery: 1714-1830, London: Antique Collectors' Club, 2007. Ronald Ringsrud, Emeralds: A Passionate Guide, Oxnard, California: Green View Press, 2009.